Xtra Spot has been developed as a stable and re-usable alternative to traditional fabric-backed varnishing blankets. The flexible polyester base guarantees sta - bility along with easy, perfect cutting – whether done manually or using a plotter. 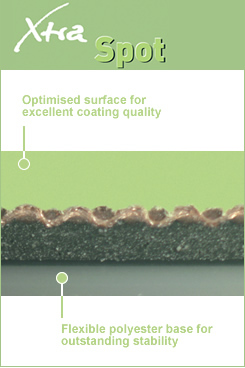 Xtra Spot offers enormous stencil depth in all gauges and is equally suitable for UV and aqueous varnishes.